Brunch is always better with a nice view. The Desert Botanical Garden’s restaurant Gertrude’s is proof positive of this idea. Named for the founder of the Desert Botanical Garden, Mrs. Gertrude Divine Webster, Gertrude’s offers an array of food with a farm to table offering that utilizes local grown (some herbs are even grown at the restaurant) and regionally sourced foods. They even go as far as pickling and brining in house! We recently had brunch there and not only did the views impress but the food did as well! We started off as any good meal should, with libations. We ordered a Rye-ly Coyote (Knob Creek Rye, Elderflower, Fresh Orange Juice, Fresh Lemon Juice, and Peychaud’s Bitters served on the rocks) and a Hand-made Garden Seltzer (we chose Blackberry, Lemon, and Cilantro). Let’s start with the Rye-ly Coyote, normally one wouldn’t think of bourbon as a brunch spirit but in this cocktail it works! Think of the Rye-ly Coyote as a manly version of the Mimosa. It tastes like a Mimosa and an Old Fashioned had a very delicious love child. The Hand-made Garden Seltzer (yes, we drink non-alcoholic beverages sometimes) was very refreshing and flavor forward. The fresh fruit and herbs used were very prominent making for a perfect brunch drink for someone who may not want something alcoholic. For our brunch choices we went the breakfast route versus lunch, however based on our breakfast, we have no doubt that the lunch items would be just as fantastic. We ordered Gertie’s Benedict (Poached AZ Eggs, Bloomsdale Spinach, English Muffin, Fingerling Potatoes, House-Made Canadian Bacon, and Tabasco Hollandaise) and the Breakfast Bowl (Smoked Pork Gumbo, AZ Eggs, Corn Muffin). Before discussing each breakfast individually, we need to take a moment to say that both had perfectly poached eggs! 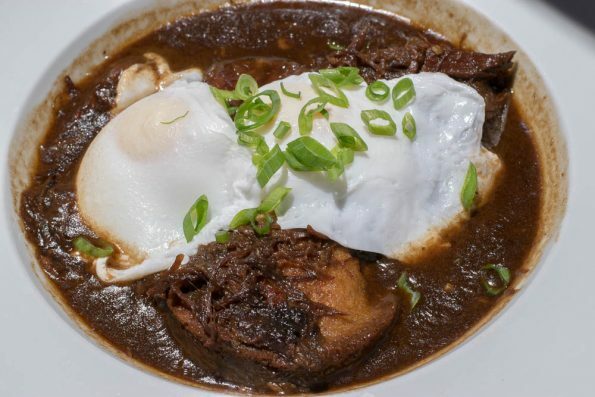 This is a huge pet peeve of ours and we are happy to report that Gertrude’s will not be going to the “No Poach” list. The Gertie’s Benedict was surprisingly light, typically a benedict comes out huge and you leave feeling super stuffed! This was not the case! The fresh spinach and thinly sliced Canadian bacon created a delicious flavor without over doing it. The potatoes were cooked crispy and were delicious! The Breakfast Bowl was suggested to us, so we had to try it. The gumbo is one of the chef’s favorite menu items as well. The broth was rich and spicy, while the corn muffin soaked up the sauce beautifully. Like the benedict, while being flavorful it also felt somehow light which is nice given that the weather is warming up and no body likes to be full when its 100 degrees out. What is a meal without dessert? Sometimes you just need to splurge a bit and get something sweet. All of the options looked phenomenal, but we went with the Irish Creme Sticky Toffee Pudding (Chocolate, Jameson Caramel, Mint Gel) and the Donuts + Sauces (Ricotta Donut Holes + Smoked Hot Fudge + Salted Caramel + Prickly Pear Jelly). We were both pretty full at this point but we just couldn’t decide between the two. The Sticky Toffee Pudding is among the best we’ve had. Decadent and rich with salty caramel, it was balanced beautifully by the mint gel. The donuts were a perfect brunch time dessert! 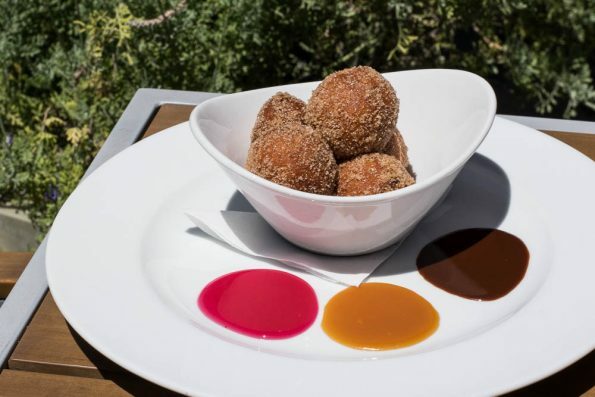 They are light on the inside and firm on the outside, but the true stars of that dessert are the sauces (but trust us the donuts are fabulous too). The fudge was just so right and the prickly pear jelly added a tartness that rounded out the sweetness of the dessert. Brunch at Gertrude’s at the Desert Botanical Garden is a delightful experience, especially if you take advantage of the views and enjoy their patio seating. We really enjoyed it and recommend it to anyone looking for a gorgeous and tasty brunch. What are some of your favorite brunch spots? We’d love to know! Leave a comment below or use the hash tag #GeekEats! 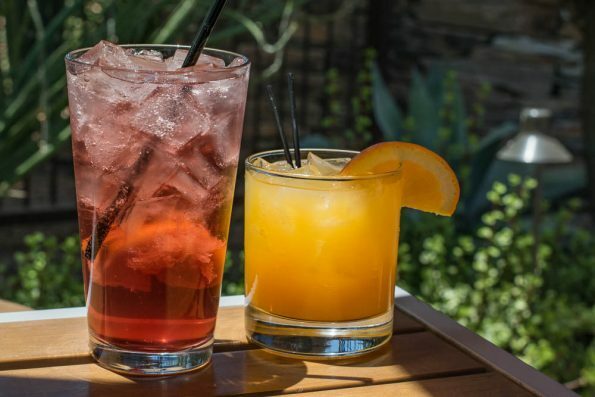 Brunch at the Desert Botanical Garden’s Gertrude’s is offered Saturday and Sunday from 8am to 4pm. For reservations visit Open Table. Gertrude’s is located at: 1201 N. Galvin Parkway, Phoenix, AZ 85008.